"I could always determine if the plant was profitable just by walking through it. That gut report doesn�t translate well to managers, as talented and insightful as they may be. What they found indispensable was Jim Grew�s concept of a scoreboard.� �Don Jones, Chairman & Co-Founder JVNW Inc.
�The impact of Jim's book on our business was immediate. His results-oriented approach and wisdom were just what we needed to get our company to the next level. Jim's insights and guidance were invaluable.� �Hal Cranston, Chairman and Co-Founder Emerald Landscape Co. Inc.
"When was the last time you had a deep dive let alone considered the impact and value myths play in your business, the power or pairs, and what talent is looking for in work? All this and much more with practical steps to help leaders get to the place where they can get The Right People in the Right Places, Doing the Right Stuff at the Right Time.� �David DeMots, CEO � Package Containers, Inc., CEO � DHX Advertising, Inc.
Business books fall into two categories: theory and impractical protocols. Both provide either ideas without applications or applications without proven theoretical frames. They are like concept cars that no one expects to drive to work. The Leader Architect provides the bridge to proven solutions based on sound theory. These solutions are being used successfully by expert leaders at some of the best companies in the world, without the elaborate external systems and training teams required by many popular approaches. 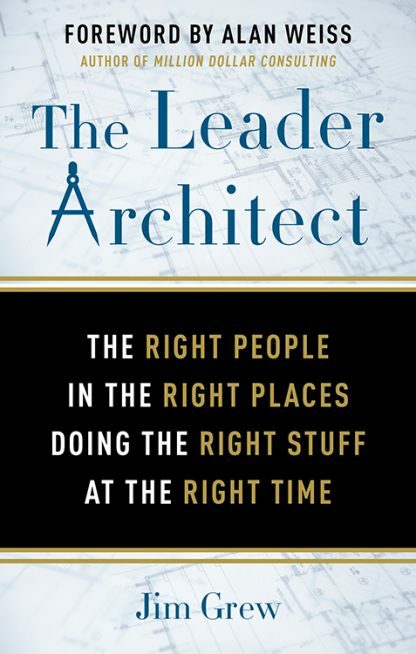 In the daily flood of �shoulds� and �wants� that fill the lives of most executives, The Leader Architect is a fresh and simple guide to tactics and tools that have worked for others�and will work for you. Jim Grew has run nine businesses and currently operates the Grew Company. As an executive advisor, he works with a select group of senior leaders to accelerate their impact. A strategist, coach, and leadership expert, Grew's unique mix of business experience and advanced psychology training is the catalyst that ignites dramatic shifts in business performance. Jim is a sought-after speaker and expert in the nuts and bolts of successful leadership. His work is based on his experience and his education at Stanford University and Stanford Graduate School of Business. He lives in Portland, Oregon.